"This Special Child will need much love,"
From all the folks she meets down there. And she'll be known as 'handicapped'. Will do this special job for you. Is "Heaven's Very Special Child." God said it is time to send this Angel to earth. I was the one chosen to give her birth. This special Angel, her wings will not work right. But with her eyes she'll speak with ease. I can call her back if I am in doubt. I say Thank you God, for her time on this earth! 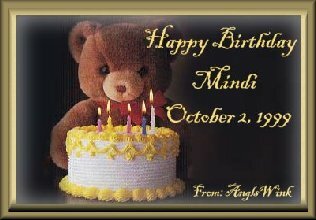 The graphics for this page were made for me by a very wonderful person, Maria.She also made a wonderful globe for Mindi.Clink on the balloon bear to go visit a page I made about her and please visit her pages too. 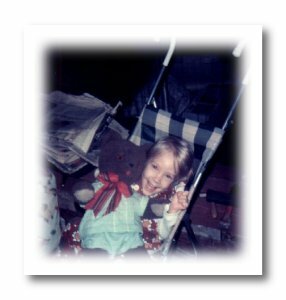 What I would like everyone to do is grab their party hats and help me celebrate the life of Mindi.Click on LINK below to see Mindi's Cyber Teddy Bear Collection. Clink on NEXT to read "A Letter To Mindi". Also check out her Halloween Page. 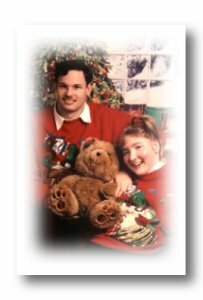 Please sign the guestbook as a gift for Mindi.